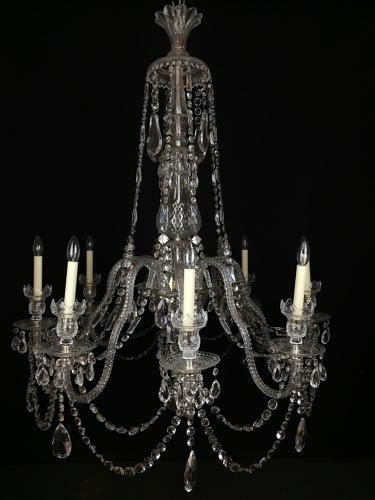 A magnificent crystal glass classical chandelier in the manner of Perry & Co with eight double crock arms, cemented with large hand cut circular faceted dishes and upswept large candle holders. Decorated with double swags of faceted buttons and upswept cascades, chained with long lozenge cuts. The central stem with a large hobnail cut ballista above a central bulb, mounted with internal central lights. The bottom terminating with canopy droplets and a central ball.